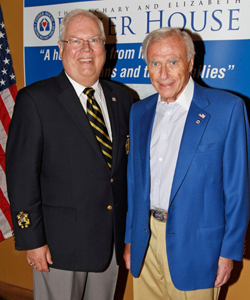 PALM BEACH, FL – Veterans and local A-listers turned out en masse to support American war heroes and the Friends of Fisher House, a group providing housing and other support for the families of injured veterans. Guests included Joseph Dryer, one of the few remaining survivors of the attack on Iwo Jima; Jerold Klein, Friends of Fisher House treasurer and recipient of the Silver Star for heroism in Vietnam; Daniel R. Baer, who served in World War II; Rodman Steele a Vietnam vet; Desmond Price, who was deployed five times and recently returned from Iraq and Afghanistan; and Ted Task and Frank Hogan, who both served as Marines during the Korean War. Also honored were veterans Leo Lezar, Scott Barber and Patrick Rielly. More than 400 people turned out for the program, which was held at Ta-boo restaurant in Palm Beach. The event raised more than $10,000 for the West Palm Beach Fisher House. The Fisher House program is a private-public partnership that provides housing for families of injured U.S. veterans who are receiving medical care at major military and Veteran’s Administration medical centers. There are 50 Fisher Houses throughout the United States. The local Fisher House is an eight-bedroom facility on the West Palm Beach VA Medical Center campus. Open since 1995, it has accommodated about 10,000 families at no cost. Each guest room has a laptop with Wi-Fi, flat-screen TV and a DVD/VCR player and access to a fully stocked kitchen to provide for their meals. During the program at Ta-boo, Arnold Fisher discussed Fisher House and its growth. Fisher is the vice chairman of the Fisher House Foundation and chairman of the Board of the Trustees of the Intrepid Museum Foundation, and serves numerous charities. Craig Dickmann and Matt deFalcoof Hamilton Jewelers presented a special gift to each of the honored veterans for their service, and several Palm Beach boutiques helped sponsor the fund raiser with raffle items. Juicy Couture and Sequin Boutique, the scene of the Black River Caviar reception and Chinese auction, extended their hours to co-host the event. Christofle presented the volunteers with sterling-silver bookmarks engraved with the American flag. Among the Chinese auction items were Village Camps in Switzerland and a golf foursome at the Ritz-Carlton Club in Jupiter. Palm Beach organizations and boutiques who participated included Hamilton Jewelers, The Breakers, Stubbs & Wootton, Christofle, Key Leaf, Emilio Pucci, Badgley Mischka, Daniella Ortiz, Tito Vodka and Island Company. 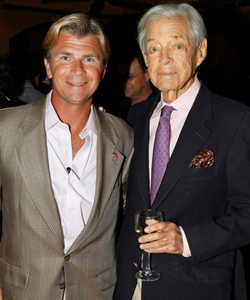 Among the guests at the dinner on July 11, 2012, were politician Lois Frankel; south Florida builder Michael Capponi; Vanessa Grout, president and CEO of Douglas Elliman, Florida; Jay Cochran, American Le Mans race car driver, and his son Rafe Cochran; Josh Lyons, Food Network reality show personality; special-event producer Bruce Sutka; TV personality Robert Riva; local CBS tech correspondent Herb Tabin; Miera Melba, of HGTV fame; and actress and former Vietnam pin-up model Chris Noel. Also attending were Philip Nicozisis, Brad Deflin, Carlos Morrison, Lucia Bonavita, Maribel Alvarez, Jim Pappas, Arvo Katajisto, Jeff Koons, Leslie Linder, Ashley McKintosh, Andres Fanjul, Daniel Jennings, Candice Jorritsma, Avery Dimmig, Adam Lipson, Alexis Posada, Pamela Tombari, Marrisa Pepper, Reid Boren, Ronnie and Jennie Hasozbek-Garcia, Diane Weiss, and Diana and Rich Horowitz. 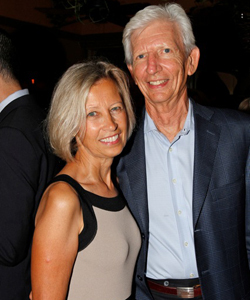 The Fisher House program was the brainchild of New York real estate developer and philanthropist Zachary Fisher and his wife, Elizabeth, who opened the first “Zachary and Elizabeth Fisher House” at the National Naval Medical Center in Bethesda, Maryland, in 1990. More than 183,000 days of lodging are provided by Fisher Houses every year. The Friends of the Fisher House, a charitable corporation, supports all the needs of the West Palm Beach VA Fisher House. Board members volunteer to raise funds for food, supplies and necessary capital improvements. It has also established a voucher program with selected area hotels to welcome families when Fisher House has no vacancies. For more information in Fisher House, visit wpbfisherhouse.org. Photos by Janis Bucher Photography and Michael Price Photography.